A person’s race is still a major factor when picking a partner, according to a study of dating app users. Research examining the preferences of Facebook dating app, Are You Interested (AYI) found black men and women receive fewer responses to their messages. It also found that men from all different races prefer a partner of another race over their own. The data comes from AYI, which claims to be one of the largest Facebook dating apps with over 70 million users and is similar to Tinder. It works by letting people looking for a date, or something more casual, flick through profiles of users and click ‘yes’ to show their interest or ‘skip’ to move on to the next. When a user clicks ‘yes’ the person they are interested in receives a notification that someone is interested and has the chance to respond. The study looked at the gender and ethnicity of the people who responded to a ‘yes’ notification, Quartz reported. Researchers for the app looked at 2.4 million heterosexual interactions by users who are mostly aged 35 and over, to collect the statistics. 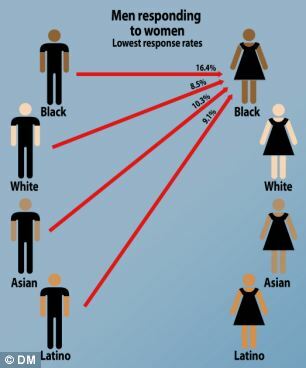 The study found black men and women get the lowest response rates to their messages. 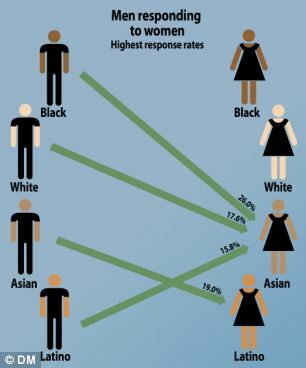 Most men prefer Asian women (with the exception of Asian men,) while all women (except black women) are most drawn to white men, according to the research. Interestingly, it found men from all racial groups tend to prefer women from races other than their own. 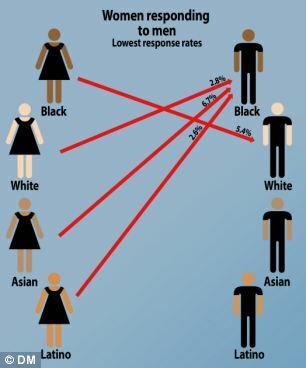 The study said Asian women seem to favour advances from white men, as they responded to ‘yes’ messages almost eight per cent of the time – more than any other race. The data suggests that men are least likely to respond to ‘likes’ from black women and did so 7.5 per cent of the time, which is less often than for Asian, Latino and White women. 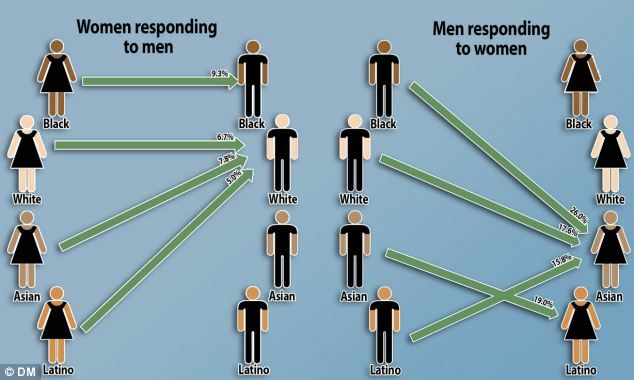 Men from all different races prefer a partner of another race over their own. Most men prefer Asian women (with the exception of Asian men). All women (except black women) are most drawn to white men. Asian women seem to most strongly favour advances from white men. Men are least likely to respond to ‘likes’ from black women. Men respond to women around there times more often than women reply to men's messages. Men respond to women around there times more often than women reply to men’s messages. However, the findings said men tend to be drawn to women from another race, contrast sharply with another recent study. 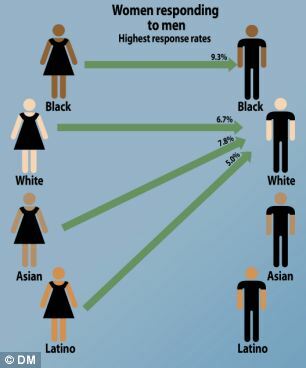 Sociologist Professor Kevin Lewis, from the UC San Diego Division of Social Sciences, found members of dating sites are most likely to contact individuals who share their own racial background on dating websites. He studied the interaction patterns of 126,134 users of dating website OkCupid.com in the U.S. over a two-and-a-half month period. The sociologist found the tendency to initiate contact with someone from a shared race, is strongest among Asians and Indians and weakest among whites, the study said. 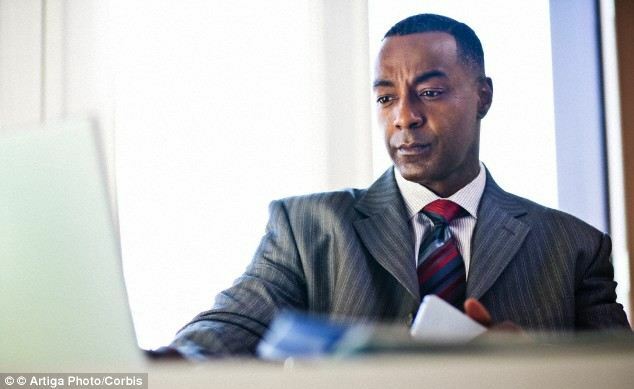 Professor Lewis' study also found that a person who is contacted by someone from a different racial background for the first time is more likely to reply, which he explains using his theory about 'pre-emptive discrimination'. 'Based on a lifetime of experiences in a racist and racially segregated society, people anticipate discrimination on the part of a potential recipient and are largely unwilling to reach out in the first place,' he said. However, he warns that the effect is sort-lived as people go back to habitual patterns in around a week.